With recent news about environmental loss and greenhouse emissions rise, I find it helpful to imagine the world moving to a war-time footing. Large scale mobilization is the order of the day. Still, some subtler planning is needed to win the fight. For example, in World War II the US began its counterstrike very early indeed — in 1939. 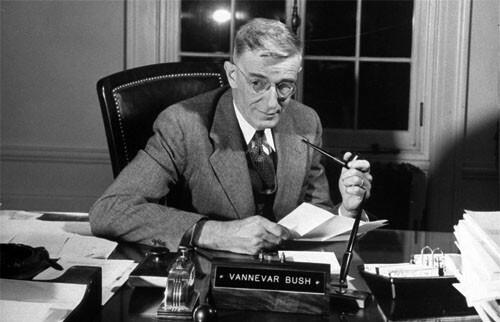 While serving at National Advisory Committee on Aeronautics (NACA, the predecessor of NASA), Vannevar Bush recognized that the US lacked the technical sophistication and scale-up to enter the fight itself. It was clear to him that ground would be lost to enemy advance, in part because of US hesitation about engaging in the war and in part because of a lack of tools and arms to do the job. This led him to propose the National Defense Research Committee (NDRC). Famously, FDR funded it after 15 minutes of discussion, writing “OK — FDR” on the one-page proposal. Importantly, the inventions created by NDRC investments did not put boots on the ground in 1941, nor did they prevent the loss of ground on many fronts. Instead, they did something outside many other people’s imagination in 1939 — enable the counterstrike. One conclusion drove the US defense research effort: winning slowly was the same as losing. The rate of ground lost provided a terrible urgency to the challenge of design and scale-up. Saving Europe and civilization required commitment, speed, and all the tools and options one could muster. If this sounds familiar, there are parallels between this narrative and the climate work ahead. It is clear that in the fight against man-made climate change, we will continue to lose ground (literally, as we lose shorelines and islands to sea-level rise) due to the paucity of scalable solutions. To save lives, ecosystems, jobs, and money, urgency is required. Some frame this urgency as the need for enhanced ambition. Doing more of what we are doing today is not sufficient. We need more and better options if we want to prevail against the threats of global warming. It’s time to mount the climate counterstrike. In his time and struggle, Vannevar Bush would often ask “Will it help us win the war? This war?” To win, the NDRC gathered scientists and engineers who created incredible inventions –new forms of radar, magnetic submarine detectors, analog computers, the Proximity Fuze, and (rather famously) nuclear weapons. Vannevar Bush, 1942 (source image here). Lost ground must be regained. Pushback is required. Victory was delivered not just by commitment and communal action, but by the invention of what victory required, born of a clear-eyed understanding of the necessary work. From my perspective in Carbonville, large-scale carbon management is the core of the counterstrike. It combines the dramatic reduction of existing carbon emissions with the development of new and improved tools to drawdown atmospheric CO2 concentrations. It stops the enemy’s progress and starts to push back. Congress, rather amazingly, just laid the financial foundation for the climate counterstrike. On Feb 8th, along with the govt. spending bill, it expanded a key set of tax provisions called 45Q. Let by bipartisan coalitions in the House and Senate, the new law (also called the FUTURE Act) provides tax credits for new projects that do three things. · If a project captures CO2 from the air, you are eligible to get credit for either use. Together these provisions will lay infrastructure, will gain financing, and will create jobs and industries we are only just now beginning to image. The first two provisions are about arresting decline, in essence strengthening the resistance to encroaching losses of global warming. That third provision, though, provides incentives to rebalance the air and oceans. It doesn’t just arrest carbon pollution in its tracks — it pays for carbon removal (also called negative emissions. It imagines engineered systems pulling CO2 from the air, and either putting it to work in the market or putting it away forever. To get these systems deployed at scale around the world, we’ll need more investment and more innovation. But I am strongly optimistic about this small but critical game-changer that emerged from our conflicted Congress. Like in the run-up to World-War Two, the US has decided that investing in innovation will make the country stronger, and will deliver the tools and teams the world needs now to both stop the problem and force it to retreat. Much more investment in innovation is needed to get the job done. It is my sincere wish and expectation that the US treats this as the opening ante and will provide more funds for innovation, driving costs down and performance up. Like in 1939, we’re just beginning. There will be losses ahead, some enormous and some bitter. If we take extra action now, we can (and will) win. Note: The metaphor and idea of the climate counterstrike, like many good ideas, came from conversations with my good friend, Dr. Roger Aines at LLNL. I invite you to follow him on Twitter @RogerAines. I’ve spent my career trying to keep CO2 out of the air and oceans, and more recently trying to remove CO2 from them. Carbon Wrangling full time.